Thank you for visiting whistlekick martial arts sparring gear and apparel. You didn’t just stumble upon our website. Chances are, you’ve long been searching for quality martial arts products to suit your training or competing needs. And this is the groundwork of our company, the very reason why our business exists. We were founded on the idea that martial arts products didn't have to be mass-produced junk. Everything we do is with quality and value in mind, just like the way we train. Yes - we're martial artists, too! You can read the story from our founder here. Whistlekick, LLC was founded in 2010 with the hope to improve on the poor-quality protective sparring gear that is so common in today's karate, tae kwon do and other martial arts schools. It took a significant amount of time and capital to launch whistlekick, but it was worth the wait and every penny. We think you'll agree. 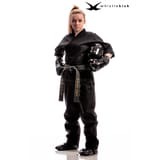 Today, whistlekick has a wide array of gear and products offered for every athlete, martial artist or aficionado of the various traditional martial arts. Our sparring gear is engineered to enhance strength and speed, providing maximum mobility while maintaining comfort to prevent unnecessary injury. We also recently launched an apparel line suited for an active lifestyle. whistlekick martial arts sparring gear and traditional martial arts apparel: designed and proudly made for practitioners of the TMA (traditional martial arts). We're pleased to serve those that practice and train in various martial arts - karate in all forms (shotokan, kenpo, kyokushin, goju, isshinryu, etc), tae kwon do (taekwondo or tkd), kung fu, tang soo do as well as the more modern arts or sport martial arts devotees. We believe that all martial arts have value, and everyone should train in the arts that bring them the highest level of happiness and fulfillment. Please be guided by our company policies below, and don’t forget to enjoy shopping! We ship in the US using USPS (free) or UPS / FedEx for an additional fee. International shipments are via the postal service. Yes, we do ship to APO/FPO addresses. Orders for in-stock products are generally packed and shipped the next business day. Exceptions may occur due to weather or other unforeseen circumstances. We'll send you a tracking number once your order ships. Did you end up with the wrong size? If so, we'd be happy to work with you to get the correct size. If it's sparring gear we're talking about, please make sure to check the size chart on the product page you ordered from. If it's apparel, that's generally a bit easier. Regardless, we don't charge additional shipping in the case of exchanges as part of our commitment to quality. We just want you to be happy with your purchase. We will accept returns of unused product so long as it is in condition for resale, meaning that it doesn't show any signs of wear. If you'd like to return a product you ordered, please contact us so we can direct you where to send it and refund your payment. All requests for returns must be made within 30 days of purchase.